BRITAIN will get behind David Davis even more if the EU continued to “play things slowly” in negotiations, a Conservative MP has claimed. John Penrose, Tory MP for Weston-super-Mare, claimed that the EU were taking their time in negotiations in a bid to get Britain to panic and pay more to the bloc to secure a Brexit deal. Speaking to Sky News, the Conservative MP insisted that the Brussels position would only play in the hands of the Brexit Secretary. The host asked Mr Penrose whether it “filled him with confidence”, after the EU’s chief Brexit negotiator appeared to give the UK a two-week deadline to reach an agreement over citizens rights, the Irish border and the divorce settlement. He said: “It depends what he is looking for and whether or not he is expecting us to pay lots and lots of money for not very in return. “What we need is a good solid trade deal and to get the discussions towards that underway. The Conservative MP added that the debate surrounding the Brexit bill depends on whether the UK get the “kind of trade deal that would be good for both the EU27 and for Britain”. Mr Penrose called for both the European Union and UK to stay “rational” to ensure that both sides benefit from a good Brexit deal. He said: “If everybody stays rational and sensible then there is absolutely no reason why we shouldn’t have a deal that is good for both sides. “There are all sorts of opportunities that could be grasped and could be brought home providing everybody stays rational and sensible. 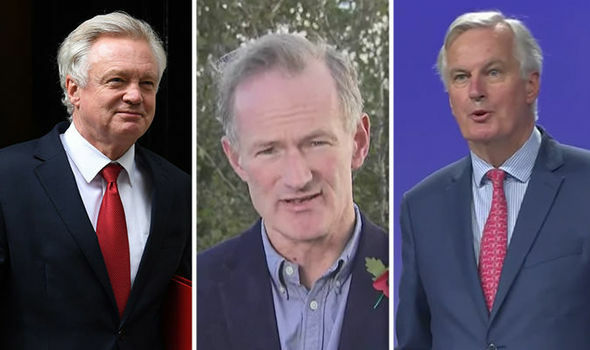 The comments come after the sixth round of Brexit talks concluded on Friday with Michel Barnier suggesting talks would drag on into the next year if the blocs demands were not met. Asked if the UK would need to offer clarification on the financial settlement in the next two weeks to get talks moving by December, the high ranking EU chief replied with “Oui”. The Frenchman accepted that negotiations were “making some progress”, but adding the talks “need to go further”. The Brexit Secretary, David Davis said it was time for the European Union and the United Kingdom to both show some flexibility, imagination and willingness” to deal with the deadlock in talks. The UK Government is keen to move proceedings onto the next phase of talks in a bid kickstart trade negotiations in December. The European Union have reiterated that it will not begin trade talks with Britain unless “sufficient progress” has been made in its key three issues. The British Government also wants the EU to offer more certainty that the bloc will simultaneously agree the outlines of a transition deal in December before any divorce bill is paid.